The ‘5-Seat Convertibles’ section in our buyers guide is a place of wonder and confusion. While it is one of the most popular pages on the site it only lists at the time of writing, two cars. The first is the mighty Jeep Wrangler, a car that may be judged as impractical (for road use) as it is characterful, and a small handsome french city car – the Citroen DS3 Cabriolet. It seems strange that there is nothing in between but look a little deeper and it all starts to make sense. When designing a convertible car on of the first things to work out is where the roof is to be stored when folded. On most convertibles it goes in a U shape around the rear seats and this requires wider side walls to contain it and as a result a narrower back seat. The Citroen DS3 Cabriolet avoids such problems by leaving fixed pillars and rear windows and gathering up the centre part of the roof behind the full-width back seat. With the roof pillars still in place there is plenty of structural rigidity left in the car and no need for lumps in the floor to take up leg room. Of course being a small city car, that doesn’t mean that this rear seat is huge but you can happily and safely put three children back there with their heads back looking at the clouds. There are three seat bels and three headrests back there and that’s more than you can say for any of the larger and more expensive convertible cars out there (with the exception of the Wrangler). So if seating 5 (not too big) people in a convertible car is your aim then you can stop here. There is a choice of two and the DS3 is the one better suited to narrow streets and supermarket car parks. If that isn’t the dealmaker for you then the Citroen DS3 Cabriolet still has much about it to attract. First off it has pretty unique looks. While competitors cars use retro styling to attract buyers, Citroen have gone for a thoroughly modern design. It is chiseled without being either overly feminine or masculine. It is beautifully detailed, particularly the lights and gives the feeling of being confident about looking different. Next to the Mini and Beetle it looks a lot more forward thinking. It certainly seemed to get a positive reaction from friends and neighbours. Inside the modern look continues with a smart futuristic style that has a premium car feel to it. The DSport model we tried had sporty perforated leather seats, a leather steering wheel and gear knob that along with the gloss black and body coloured dashboard made it feel a step above the average small car. It feels roomy inside particularly in the front – a little more spacious than a Mini or Fiat 500. It all feels well put together and the equipment level is impressive. Even the base model comes with central locking, cruise control (annoyingly hidden away behind the steering wheel) and electric windows. The DSport also has climate control and bluetooth connectivity. Individuality is key to the DS3 concept and there is an almost endless selection of options to customise your car including different roof designs and colours. The roof works much like that seen on the Fiat 500C. It folds back at the press of a button, first gathered up above the rear window and then with a second press the window itself folds as well. While it may only be the centre part of the roof that folds this has benefits to counter fears that this isn’t a ‘proper’ convertible. First off is rigidity. The DS3 Cabriolet is as stiff as the fixed roof version and looses none of its good roadholding while only gaining 25kg in weight. Secondly it doesn’t need a huge space to store the folded roof and keeps ample luggage space with the roof up or down. With the roof down you still have that open-air feeling but it never gets too breezy or noisy even at high speeds. Should the wind or weather ever become a problem then the roof can still be shut at speeds as high as 75mph. On the down-side rear vision with the roof fully open is poor and we preferred the first stage for town driving. The luggage space is great, but access is a bit awkward as you have to reach in rather down and at a fairly low level. The door opens outwards a few inches then slides up vertically keeping it nicely out of the way. It did seem to swallow up quite a lot of weekend shopping and would be ample for a week away for two. The car designer’s benchmark – a couple of sets of golf clubs, would surely fit if you could only squeeze them through the relatively small opening. It has a high seating position which although the norm in modern small cars, does make the driving experience less involving. The sports suspension is more forgiving than the firmly sprung Mini, but it corners well with a responsive feel and good control. The large 17-inch alloy wheels and skinny tyres do their usual trick of making the DSport a little more jiggly at low speeds, but overall the ride is as smooth as we have come to expect from Citroen. The steering is well geared and light for city driving but does lack some feel in the bends. 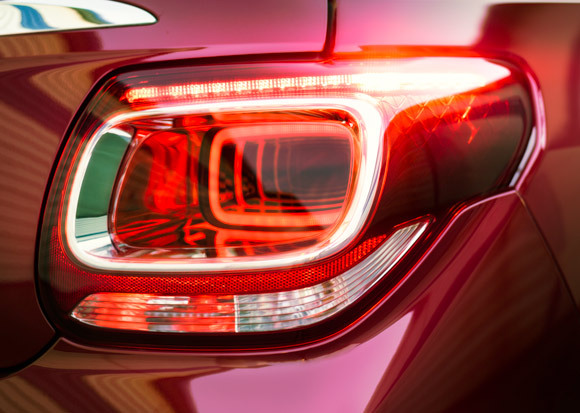 Driving is something the DS3 likes to do and with the familiar 1.6 Prince engine (also found in Peugeots, Minis and BMWs) here in turbocharged form in the DSport there is plenty of eager performance. It is responsive at lower speeds, refined for high-speed cruising and even economical. 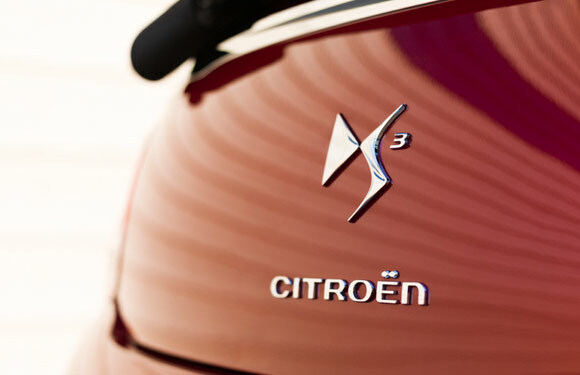 Citroen claims a combined 47 mpg which it managed for us on a long run on mixed roads. The other engine options are also impressive with normally aspirated (not turbocharged) 1.2 and 1.6 options. In a world where car designers so often look back to past classics for inspiration it is nice to see a car that is so thoroughly modern and different. If you are happier in the 21st century than the 20th or want to squeeze three little people in the back seat then the DS3 Cabriolet may suit you very well. 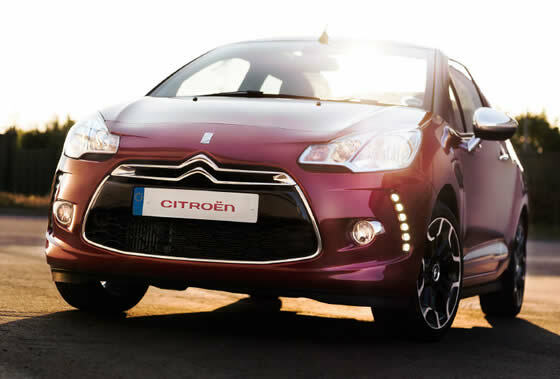 While the soft-top Mini Cooper S may still rein as the enthusiastic drivers choice, the convertible Citroen DS3 is the more practical and comfortable with an equally attractive design. The Fiat 500 Convertible is a characterful car with an effortless style that makes competitors look like they are trying a little too hard. For this budget you could have the sporty Abarth model with cash to spare. On the downside it is smaller than the DS3, less economical and has less luggage space. The new new Beetle is better than the previous model in every way. It is a bigger car than the DS3 and has VW’s comforting build quality but has less rear seat and luggage space. It is also more expensive for similar performance levels. The 207CC GT shares the same engine as the DS3 Cabriolet DSport and shares similar performance, that’s where the similarities end though as the Peugeot is more of a two seater – I’ve yet to find someone who can fit in one of the back seats. It has a slick folding hardtop roof with both the added security and loss of luggage space that provides. The Citroen DS3 Cabriolet was reviewed by Convertible Car Magazine. © Copyright 2013 Convertible Car Magazine. Convertible Car Reviews - Citroen DS3 Cabriolet Review.